Getting back into exercise after having a baby can be a struggle. With reduced sleep and trying to get into a new routine, exercise may seem like the last thing on your mind. That’s where jogscotland‘s Mums on the Run programme comes in. Designed with the needs of mums at heart, the Mums on the Run programme offers guidance, advice and solutions to help mums across the country enjoy the physiological, social and psychological benefits of getting out and being active. You can take your wee one to class with you in the buggy, so there’s no need to worry about arranging childcare while you exercise. There are a number of Mums on the Run groups around the country – go to our Group Finder and use the filter to search for Mums on the Run groups near you. We would love to see more groups set up across the country – if you think you could lead a new group, contact Jo Stevens to order our FREE booklet and get started. Jo Pavey backs Mums on the Run! Jo, a mum-of-two who won both Commonwealth Bronze and European Gold at the age of 40, has given her backing to our Mums on the Run programme. 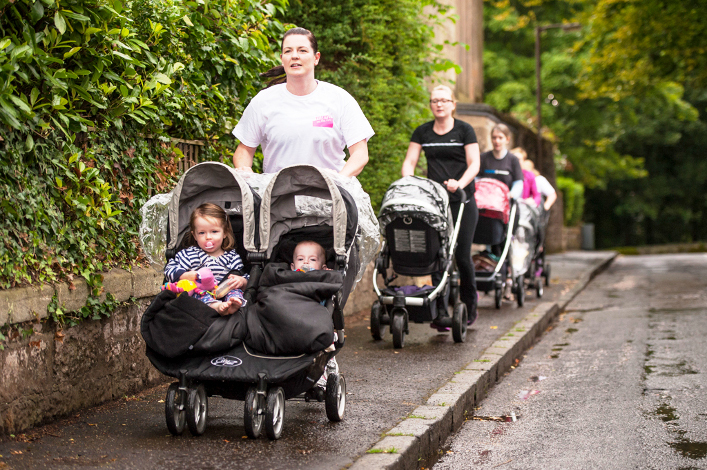 She said: “Mums on the Run is a fantastic thing to do after you’ve had a baby. “Becoming a mum is an amazing experience, but it’s tiring and leaves you without much time for yourself. After weeks of sleepless nights, the last thing on your mind is exercise. But you know it always leaves you feeling better if you can get out and do something. “Mums on the Run lets you exercise at your own level, whether you’re an experienced runner or a complete beginner. You bring your little one along in the buggy, so there’s no need to arrange childcare, and they might even have a nap while you’re working out. Even if they don’t, at least you’ll both get some fresh air! “It also gives you the chance to spend time with other mums who also like to keep fit.